Deadpool 2 is slicing its way across the big screen, cutting down the competition to assume the box office throne. Like any good blockbuster, it only got there by turning its blade on itself and trimming its own fat to become as tight and lean as it could be. A disgusting analogy, perhaps, but an appropriate one for the blood-spattered Merc with a Mouth. Editing is particularly tricky with a movie that balances as many tones as Deadpool 2. Finding the perfect balance of raunchy chuckles, slam-bang action, and emotional payoff required a certain amount of trial and error from director David Leitch and screenwriters Rhett Reese, Paul Wernick, and Ryan Reynolds. Leitch has stated that the eventual home video release may contain about 20 minutes of additional material, but you won't have to wait that long to get a taste of what you're missing. The cast and crew have already hinted at a long list of cuts, and we've got a complete rundown for you. One particular deleted moment has already become infamous. 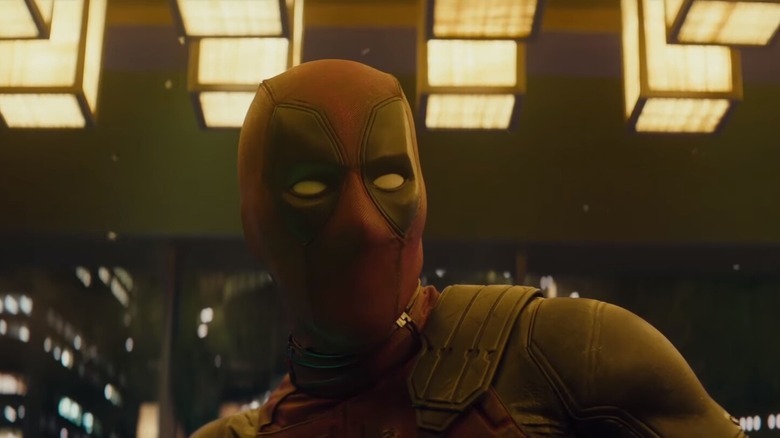 The mid-credits scenes in Deadpool 2's final cut delighted fans by sending Wade Wilson on an excellent adventure through time. Not only does he fix some of his own mistakes, he erases X-Men Origins: Wolverine's failed attempt to bring him to the screen and even stops Ryan Reynolds from making some career missteps. An effort to clean up some much bigger problems, though, left those who saw it somewhat uneasy. A scene originally intended for the very end of the end credits found Deadpool in a nursery where a baby Adolf Hitler sleeps in his crib. Though even Deadpool felt slightly queasy about infanticide, he rallied his strength and leaned in to smother the future fuhrer. The scene was shot and even appeared at the end of test screenings, but the filmmakers realized it wasn't a great way to send people out of the theater. "Sure, it's baby Hitler," Wernick reasoned, "but it is a baby. It's kind of weird to watch that! We are Deadpool, but there is a line we can't cross." Another post-credits gag never made it in front of the camera, though it likely would have been far less controversial. Reese and Wernick conceived of a bonus round of rejected X-Force auditions, and one scripted entry would have had Chris Evans reprise his role as a high-profile Marvel character…though not the first one you might think of. 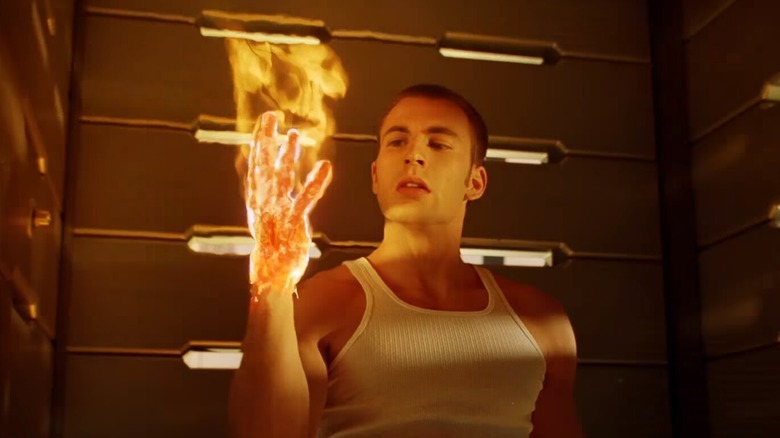 Don't forget that before he became Captain America, Evans starred in 2005's Fantastic Four and 2007's Rise of the Silver Surfer as the Human Torch (a role that seems to be a stepping stone to MCU success). While Fox doesn't yet have the rights to bring any Avengers directly into their movie universe, this would have been a clever capper to Deadpool 2's MCU winks and to its skewering of Fox's own Marvel misfires. Given that Evans has always been game to play jokey cameos (see Thor: The Dark World and Spider-Man: Homecoming), there's a good chance he would have accepted the opportunity. However, the idea was dropped before any offers were made, in favor of the time travel shenanigans we got instead. Deadpool 2 certainly wasn't afraid to embrace its R rating. It had no reason to be, after its predecessor's box office success. Still, director David Leitch was aware that he couldn't just lean on senseless violence for the sequel, and he tried to be mindful of how much was too much. "In editorial we maybe reigned ourselves in because we didn't want to subvert a comic moment or an emotional moment," he explained to Bloody Disgusting. Leitch, whose previous work includes Atomic Blonde and the John Wick films, is no stranger to fight scenes that are both stylish and over the top. The sequence in Deadpool 2's opening montage that finds Wade mowing down a bathhouse full of yakuza certainly lives up to that tradition, though it was more intense before it left the cutting room. In the same Bloody Disgusting interview, Leitch described "a seamless 360 shot" that he was particularly sorry to drop from the sequence. 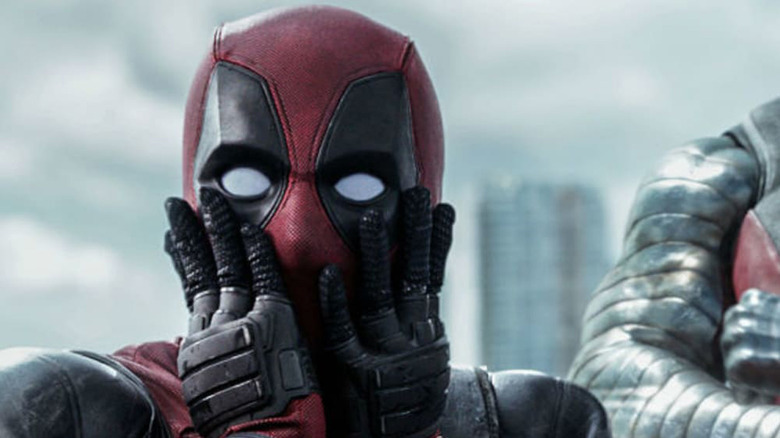 Minor trims to moments of violent action are one thing, but Ryan Reynolds has hinted that a far more foundational change was made to Deadpool 2 during its development. In the finished film, Wade and Vanessa's desire to have a child is a significant element of the first act, but these plans only serve to underscore the tragedy of her untimely death. Initially, however, the filmmakers nearly had a successful conception occur between the two movies. 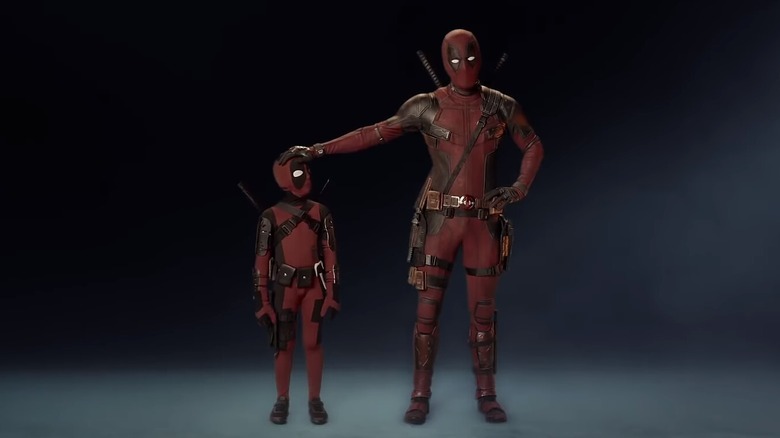 "In early drafts, we had Deadpool as a dad," Reynolds confirmed to Entertainment Weekly Radio, "and by page, I think, two-and-a-half, we realized that's a terrible idea." Despite the fact that the concept clearly didn't make it very far off the drawing board, it would have made for a very different Deadpool 2. It certainly would have had a radical impact on what Reynolds refers to as "a family film, wrapped in an insane, murderous, rated-R comedy." 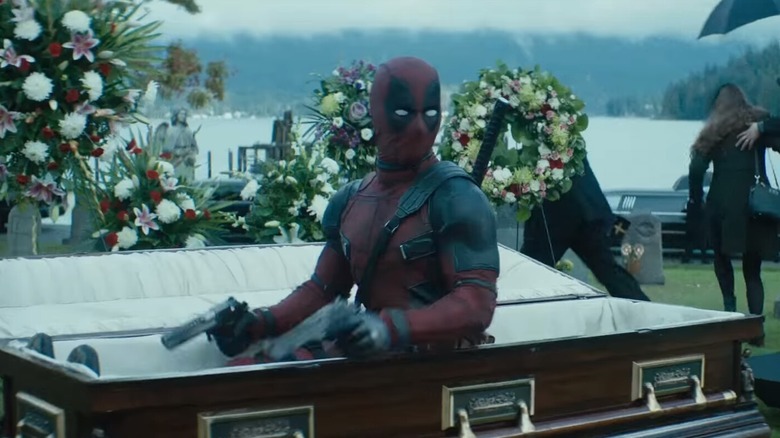 The death of Vanessa remains one of Deadpool 2's most controversial story decisions, given the long-running tendency of comic books and action movies to kill off female characters in an effort to motivate male protagonists. Regardless, she does maintain a significant presence throughout the film, appearing to Wade in a number of scenes in which she speaks to him from the afterlife. The final cut makes this thread a little less substantial than it could have been, with the loss of one sequence that was particularly laborious to shoot. 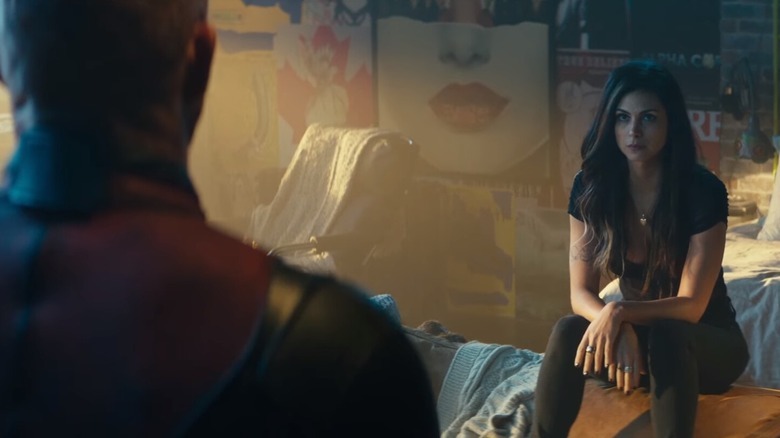 Morena Baccarin, promoting Deadpool 2 on Good Morning America, shared her annoyance at the loss of a dream sequence set in a version of Vanessa and Wade's apartment that was completely submerged in water. Rather than achieve the surreal visuals with digital effects, the filmmakers constructed an aquatic set and put the actors through scuba training. Baccarin even had to overcome a phobia of drowning, and suspects her inability to exude the proper amount of serenity led to the scene's eventual omission. Wade's grief over the loss of Vanessa (and, to a slightly lesser extent, Wolverine) weighs on him heavily. So great is his misery that he spends much of the movie trying to do the one thing his mutant healing abilities won't allow him to do: die. While this death wish becomes a source for some genuine pathos, it was also the catalyst for a major bit of comedy that ended up left on the cutting room floor. We do see Deadpool successfully blow himself up, but a rescue by Colossus puts an end to that. However, Reese and Wernick revealed during a Reddit AMA that, at one stage, there was a montage of his increasingly absurd suicide attempts, in which he tried everything from drinking Drano to jumping into a polar bear enclosure. Despite the scrapping of the entire idea, the scenes were shot and are likely to surface on the eventual Blu-ray release. It's unsurprising that Deadpool 2's anarchic, fourth wall-shattering brand of comedy would lend itself to some delightfully surprising cameos. The first film's low-budget, R-rated riskiness meant there weren't any big names popping up (except for Stan Lee, who ironically only appears in Deadpool 2 as a graffiti portrait), but for the sequel, the stars are out in force. Whether it's the main X-Men cast hiding from Wade in their mansion or Brad Pitt flashing across the screen as the Vanisher, you can't swing a katana without hitting a celebrity. Two cameos that most moviegoers missed at first glance are hidden in plain sight. When Cable arrives in our time from his dystopian future, he startles two rednecks debating the merits of proper bathroom hygiene. 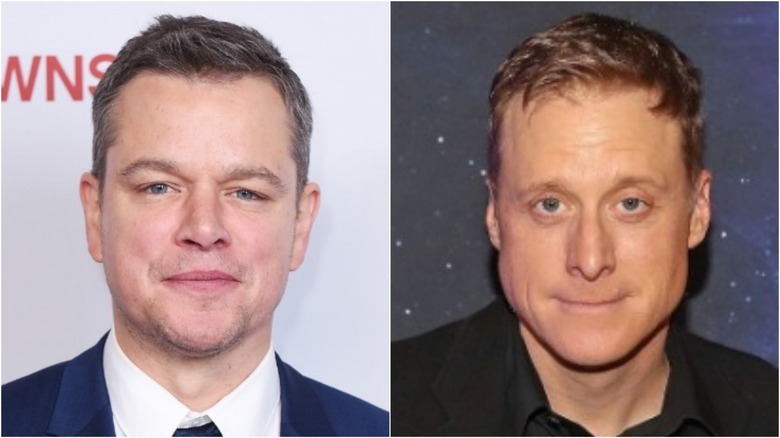 Hidden beneath prosthetics and thick fake accents are Matt Damon (who also recently appeared in Thor: Ragnarok) and Alan Tudyk. Josh Brolin revealed in a Collider interview that this scene was "cut in half." It's unsurprising that this conversation was tightened up as much as possible, given that its entire purpose is to be interrupted. Still, don't be surprised if the rest of it turns up eventually. 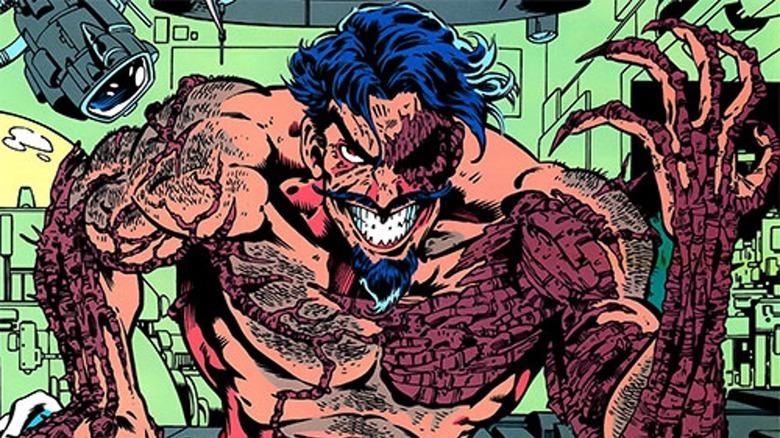 Black Tom Cassidy holds a significant position in Deadpool's comic book history. Cassidy, cousin of X-Men member Banshee and one half of a dirtbag duo with the Juggernaut, was an antagonist in the very first Deadpool solo story. Traveling the world as a mercenary and soldier of fortune, Black Tom was a mutant who could direct energy through wood (he usually wielded a shillelagh, because if you're Irish in an X-Men comic, you're going to be very Irish). A run-in with Cable left him with wooden skin grafts, but rather than enhance his powers, this foreign substance began slowly taking over his entire body. That's where his need for Deadpool's healing factor came in. When it was announced that Jack Kesy had been cast, fans expected Black Tom to have a major role in Deadpool 2. Sadly, Cassidy is quickly dispatched halfway through the movie during the same action sequence that wipes out most of X-Force. He doesn't even get to share any screen time with his old pal Jugs. The screenwriters explained that there was indeed a draft with much more Black Tom. He was intended to survive to the end of the movie and play a part in the climactic orphanage showdown. The reduction of his presence was mainly a matter of budget, with the filmmakers deciding that their CG abilities were better spent on Juggernaut's rampage than Black Tom's wood powers. "We can always go back in time and make anybody alive," Rhett Reese consoled fans, "so perhaps he'll come back." The filmmakers of Deadpool 2 may have chosen to back down from excessive violence and baby murder on their own accord, but one bit of censorship came from above. Despite their support for the movie's R-rated irreverence, it turns out there's at least one group that 20th Century Fox is afraid of offending: the Walt Disney Company. It's hard to blame them, given not only the Mouse's power but the ongoing buyout negotiations between the two media giants. Ryan Reynolds revealed to Entertainment Weekly that one "sore spot" about the making of Deadpool 2 was Fox's request to remove a joke made at the expense of Disney. 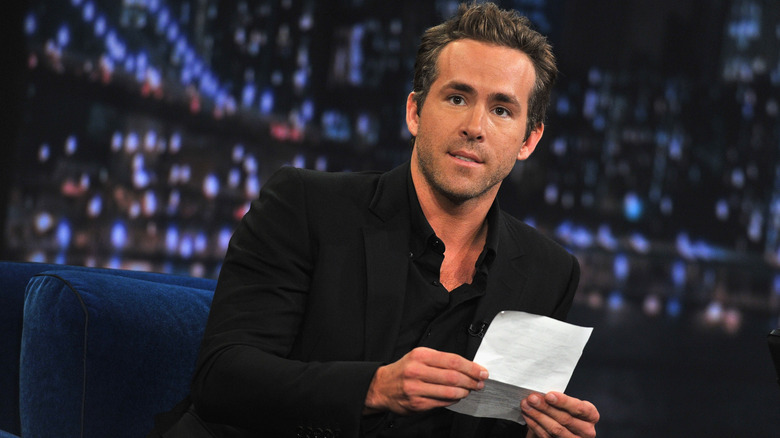 "As I look back at it," Reynolds admitted, "I think maybe that was a wise decision." He has refused to explain just what the joke was, but it's hard not to wonder if the merger, which has been in the works since last year, had something to do either the content or the cutting of the scene. It remains to be seen just what will become of Deadpool and his mutant acquaintances if they come under the same corporate umbrella as the MCU, but Disney CEO Bob Iger has speculated about maintaining a "Marvel R brand" that would allow the edgier stories to continue unabated. Pop music is an important part of the fabric of both Deadpool movies. The very first trailer for the original set a tone of semi-ironic retro cool by making prominent use of Salt-N-Pepa's "Shoop" and DMX's "X Gon' Give It To Ya." The sequel ups the ante with tracks from Peter Gabriel, Cher, Dolly Parton, and even a brand-new single from Celine Dion. Pat Benatar's classic ballad "We Belong" soars over Deadpool 2's finale, underscoring the connection forged between the surviving members of X-Force. What you might not know is that this was initially intended as a payoff to the team's first scene together. 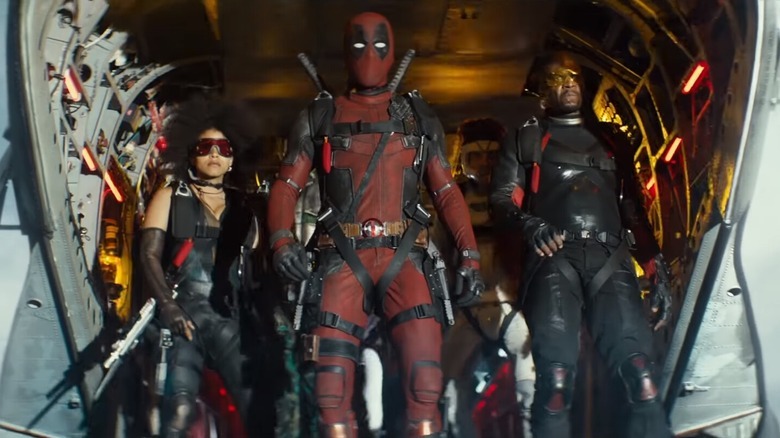 The movie's centerpiece action sequence, in which most of X-Force is wiped out in a disastrous parachute jump, was originally set to "We Belong." During post-production, the song was switched out for AC/DC's "Thunderstruck" (partly as a nod to Iron Man 2), which Reese and Wernick describe as "sort of a bummer." Speaking of music, there's one more noteworthy Deadpool moment that's still M.I.A., and this one's been in the drawer for a while now. Back when they were still hard at work on the first drafts of Deadpool 2, Reese and Wernick mentioned during an interview with Business Insider that there was "a ton of stuff from the first movie that will be in the second movie." 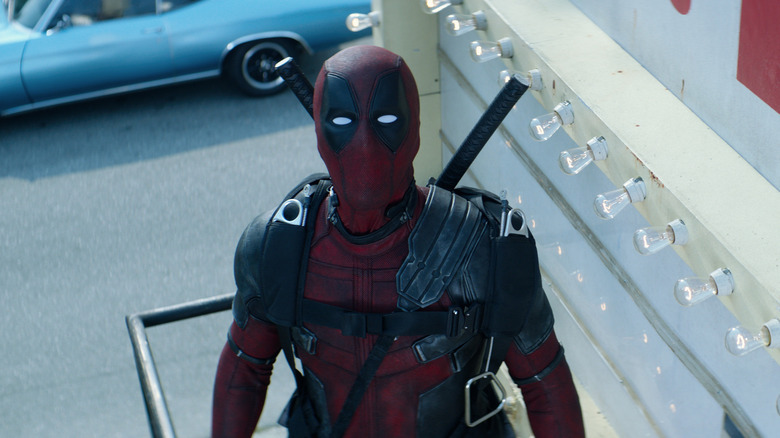 One scene that the pair was especially excited for audiences to eventually see had Deadpool giving a rousing karaoke performance of "The Gambler" by Kenny Rogers while taking down a gang of bad guys. The scene was finished, and in fact, Wernick confessed to being so delighted by Reynolds' performance that he kept the video on his phone. The footage nevertheless remained unseen by audiences, likely because of the writers' hopes to include it in the sequel. The gamble has yet to pay off, since we all know now that 2 features no such scene.